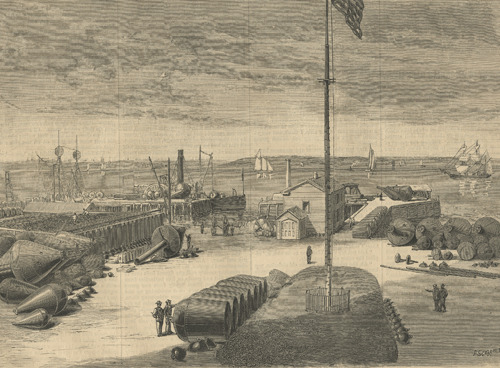 By 1846 all vessels coming into the harbor were subject to quarantine inspection. 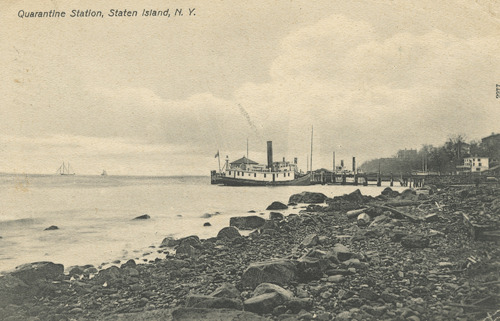 Incoming ships were anchored near Staten Island. Passengers were examined and if found sick were sent to the quarantine hospital on Staten Island. If there were sick passengers onboard, the ship had to remain in quarantine for 30 days. It wasn't the most effective quarantine system in the world as two days a week visitors were allowed, and hundreds came by ferry from the city to Staten Island to visit. In 1847 there were 600 cases of small pox, 3,000 of typhus, and sixty cases of cholera at the quarantine hospital. 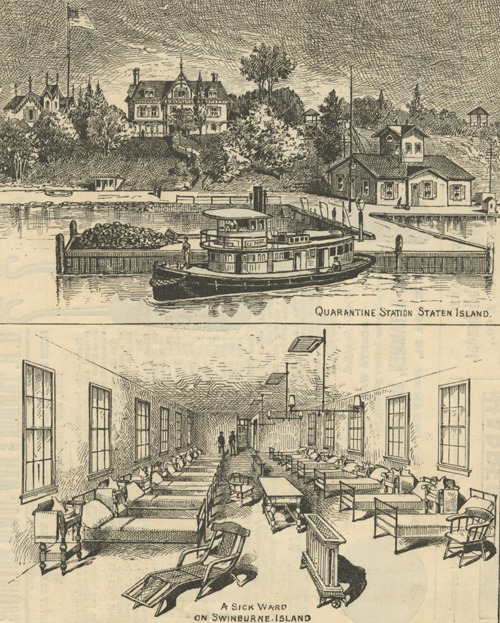 As the population of Statin Island grew many people were unhappy about the closeness of the quarantine hospital. 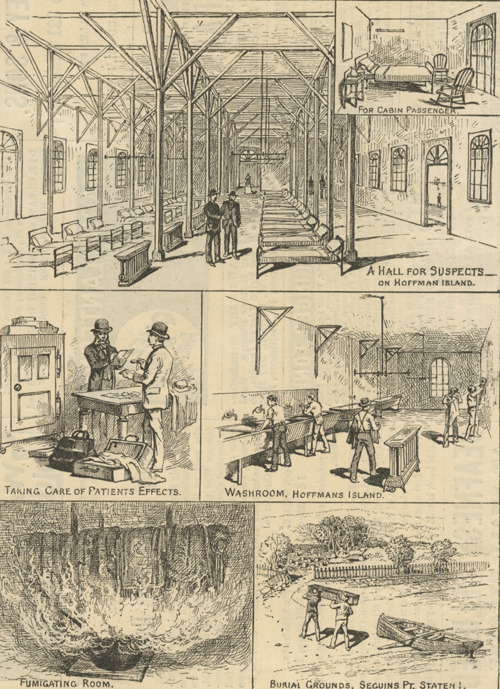 In 1857 and angry mob burned the facilities. Two islands were built with land fill in the Lower Bay - Swinburne Island in 1860 and Hoffman Island in 1873. "encounters "the stead roll of the Atlantic," and the full force of the winds and storms. The row of long white hospital wards unmistakably indicates its character. Far away to the right, eight miles distant, at Seguine's Point, on the Staten Island shore, is the quarantine burying ground. Three miles and a half from Swinburne Island, in a nearly direct course toward Sandy Hook, is anchored, during the quarantine season, the hospital or boarding ship Illinois. Her great dismantled hulk can be seen for a long distance. The Boarding Officer for the lower bay resides upon this ship. All vessels arriving from the West Indies, South American ports, and from the west coast of Africa are required to come to anchor here while the Boarding Officer inspects them. All other vessels proceed up through the Narrows, and are boarded in the upper bay, opposite the Health Officer's residence, by the deputies, who are provided for this purpose with the steamer Governor Fenton. The object of boarding from two points (viz., upper and lower bay) is to keep all vessels coming from infected ports, or likely to be infected with cholera or yellow fever, as far away from the city as possible. 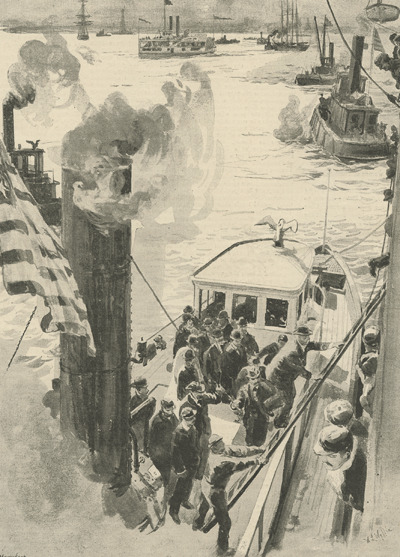 As these vessels come to anchor near the Illinois, the Boarding Officer leaves the latter in a small boat and visits them aboard, the vessel is fumigated; after being detained twenty-four hours or more, as may be required, she is permitted to proceed through the Narrows to the upper bay, anchoring not far from New York, between Robbin's Reef Lighthouse and Bedloe's Island. Her cargo is here discharged into lighters. Then the vessel is cleansed, her hold is washed out, pratique is granted, and she is permitted to proceed on up to her wharf. When the Boarding Officer from the Illinois finds any yellow fever or cholera patients on the incoming vessels, a signal is set, and one of the steamers belonging to the quarantine service comes and bears away the sufferers to Swinburne Island. Immediately upon reaching there they are stripped of their clothing, which is at once burned in a furnace constructed for that purpose, and they are placed in the sick wards. If recovering, the patients are removed across to the convalescent wards. They are then permitted to take daily exercise on the walk surrounding the wards, or to recline by the hour upon the grass-plots in front of the Superintendent's residence, where they are protected from the sun's rays by a heavy canvas. This change to outdoor life rapidly hastens their recovery, and, in fact, the whole surroundings of the hospital are so conducive to health, that nearly all the patients who are brought here in time are restored, and yellow fever has no terrors whatever for the persons and employes upon the island, of whom but one has ever contracted it. 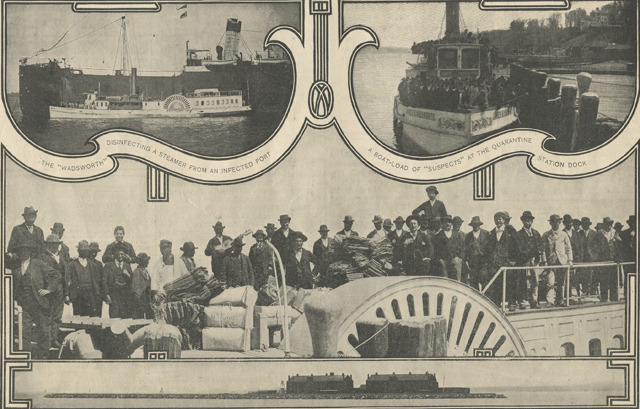 When sufficiently well, the convalescents are taken to Brooklyn or rejoin their vessels. In case of death, the bodies are placed in plain coffins and carried in small boats across the bay to the burying ground at Seguine's Point. A complete record is kept of each patient, and of all the facts that can be gleaned from him upon reaching the hospital. When buried, a board slab is placed at the head of the grave, containing a number which corresponds with the hospital record. The Commissioners are frequently called upon by friends for bodies, five, ten, and even twenty years after they have been buried. Residing upon the Illinois with the Boarding Officer from May 1 to October 15 are a ship-keeper, cook, and servants. Every appliance is kept aboard for removing patients, including chairs in which they are strapped during heavy weather and let down from vessels into the quarantine boats, which convey them to the Swinburne Island hospital. Transfer clothing is likewise provided on the Illinois for yellow fever patients to take with them to the hospital. There are very commodious apartments upon the Illinois, including a cabinet, reception, sitting, and dining rooms, kitchen, dormitories, etc. 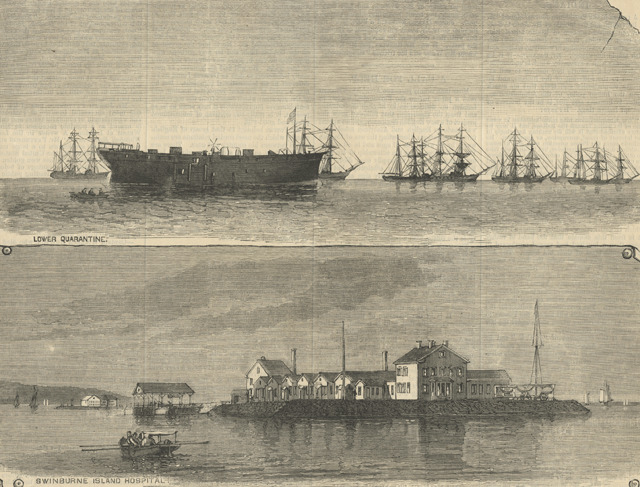 Our illustrations on page 704 show all the incidents alluded to in the foregoing description, from the arrival of the foreign vessel at lower quarantine until she is permitted to proceed to her dock. 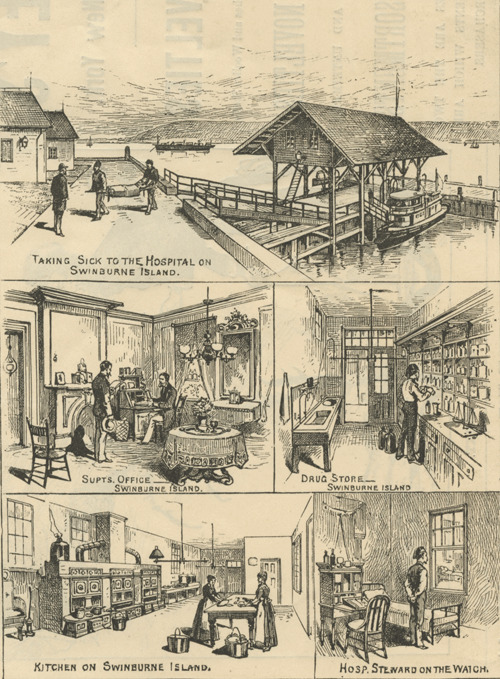 By 1900 The New York State Quarantine Station was examining an average of four to five hundred vessels a month. This required inspections of over four thousand immigrants in addition to the crews and passengers of ships not carrying immigrants. Not all ships were throughly inspected. Ships coming from non infected ports were boarded by the health inspectors. The ships doctor presented his report and all immigrants paraded in front of the heal officials with their heads uncovered. It was a quick check to see if there were obvious cases of such diseases as small pox. If there are any suspicious cases, they are further examined. The saloon passengers are not subjected to this inspection but are cleared on the word of the ship's doctor. "The difference in the treatment of saloon and steerage passengers is a measure due to the fact that infectious diseases are almost always transmitted by the latter class." Note: Infectious diseases are NOT class conscious. There were occasions when the ship's doctor was more that happy to cover up illness to accommodate important passengers on the ship who were anxious to return to business. Of course, a port could at any moment become infected. Consequently ships coming from the East and the Mediterranean would have been more susceptible to inspection. Naples, the major port of Italian immigration was known to have frequent cases of smallpox. Ships coming from "infected" ports were carefully inspected. If there are any question of illness on board the entire ship is held in Quarantine. In 1901 passengers where held a Hoffman island and the hospital and crematorium were on neighboring Swinburne Island. Today this islands are uninhabited and off limits to the general public. Bubonic plague, cholera, diphtheria, smallpox, typhoid fever, and yellow fever where the major diseases looked for by the health inspectors. LOWER QUARANTINE - Lower Quarantine was in the Lower Bay - between Statin Island and Coney Island. SWINBURNE ISLAND HOSPITAL - Swinburne Island, a man made island off the shore of Staten Island, is currently unused. 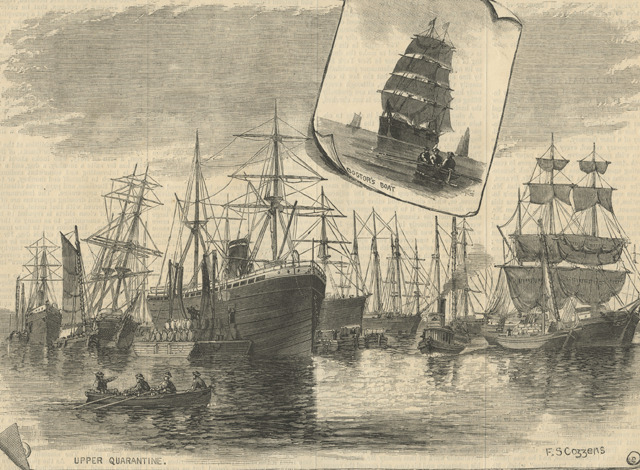 In August to September 1892 there was a breakout of Cholera in ships entering New York Harbor from Hamburg, Germany. 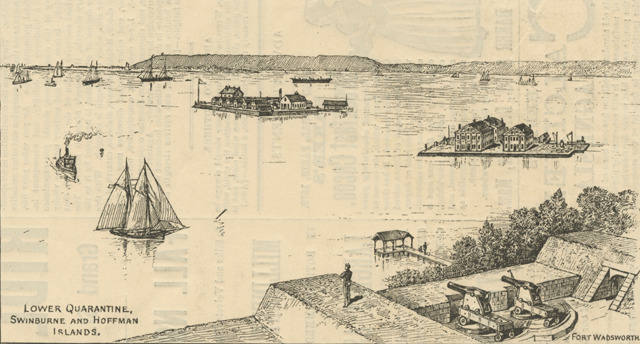 For more information on this outbreak and for more images of the Quarantine Station go to Cholera Outbreak in New York Harbor 1892 now or at the bottom of the page.